Who doesn’t happen to love hamburgers? Well, apart from a very long historical ancestry in the local Philippine restaurants, this particular hamburger foodcart business franchise idea came from the fact that it has become a very popular food in the street corners in the Philippines today. A well known franchise however is the Angel’s Burger franchise which is known to sell like hotcakes because of the unique buy 1 take 1 idea. 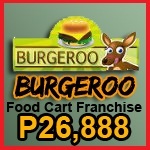 To help out interested parties to put up a small business franchisee concept venture similar to selling hamburgers at a cost-effective price package of foodcart franchise in the Philippines, Burgeroo is made. Currently, the full cost is only about Php 26,888.00 if you are asking me how much it costs to venture in this business either in malls or popular marketable places all over Metro Manila and surrounding provinces. Read more below for the inclusions and other related information below. Please note that you have a choice to include this particular franchise in our special offer of the 2-in-1 food cart package concept or 3-in-1 food cart package. This package is inclusive of free and unlimited trainings and seminars for you, your crew and now equipped with an accident insurance for a year worth P50,000.00 covered by Sunlife Insurance. This also includes a fully functional free E-Loading business powered by Loadcentral. Interested in this particular foodcart business franchising? Contact me Sam (366-36-45 / Sun CP: 0932-872-5532) or email me at casuncadster@gmail.com. I promise to reply to all your concerns as fast as I could via your email. This entry was posted in Foodcart and tagged burger cart, burger kiosk, hamburger foodcart. Bookmark the permalink. I leaving in Bacoor Cavite Ex OFW Im intested to francise but i dont have the palce please advice. Im interested available ba kayo sa negros? We already have place where we can put up burger food cart please send us details on where is your office so that we can process franchise. I was trying to call your no. 0932 872 5532 but no one is answering your phone. I am interested in burgeroo franchise. Where can i get the requirements and cost of package? how to apply for a franchise. I have a prospective area in qc to put the cart. Pls send me complete package and information.